Wigan winger Charles N'Zogbia has been called up to a new-look France squad for the first time for their friendly against Norway on Wednesday. N'Zogbia, who is of Congolese descent, had previously expressed a desire to play for England, his home since 2004. He is one of 15 uncapped players in a group missing all 23 World Cup squad players, who were suspended due to the infighting that marred their campaign. The match in Oslo represents new France coach Laurent Blanc's first in charge. Blanc took over from Raymond Domenech, who had been in charge since 2004 and led the French during their disastrous World Cup in South Africa, which saw them exit in disarray having earned only one point in the group stages. Domenech's decision to dismiss Nicolas Anelka from the squad caused a mutiny, which saw players refuse to train ahead of their match with the hosts. As well as the uncapped players, Blanc has also recalled Arsenal's Samir Nasri and Real Madrid striker Karim Benzema, who were both left out of the World Cup squad by Domenech. Former Chelsea, Portsmouth and Arsenal midfielder Lassana Diarra - currently with Real Madrid - is recalled having missed the summer tournament because of illness. Nice striker Loic Remy, who is a reported target for a number of Premier League clubs, is also in line to earn his first cap. 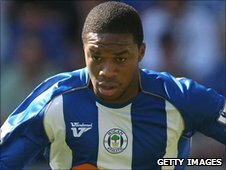 N'Zogbia, 24, who has previously represented France at Under-21 level, was Wigan's Players' Player of the Year and Fans' Player of the Season for 2009/10. France squad: Nicolas Douchez (Rennes), Stephane Ruffier (Monaco), Aly Cissokho (Monaco), Mathieu Debuchy (Lille), Rod Fanni (Rennes), Philippe Mexes (Roma), Adil Rami (Lille), Mamadou Sakho (Paris St Germain), Benoit Tremoulinas (Bordeaux), Yohane Cabaye (Lille), Lassana Diarra (Real Madrid), Blaise Matuidi (Saint-Etienne), Yann Mvila (Saint-Etienne), Charles N'Zogbia (Wigan), Samir Nasri (Arsenal), Moussa Sissoko (Toulouse), Hatem Ben Arfa (Marseille), Karim Benzema (Real Madrid), Jimmy Briand (Lyon), Guillaume Hoarau (Paris St Germain), Jeremy Menez (Roma), Loic Remy (Nice).